Despite the recent cloudy weather in Hong Kong, the weather seems going to be good in the Christmas holiday. I wish clear skies are waiting for me! However, I was totally down today! I went to the Lion Rock Mountain today with the Hiking Club members. Apart from the foggy weather, it was cold and dry. It was good for hiking! However it was my fate too! When we walked for an hour, I needed to check the map to make sure that we were in the right trail. As I needed to find the map from my backpack, I asked one of my students to hold my camera for me. While I was reading the map, he suddenly dropped my camera! Good grief! My D80 and 18-200mm VR were gone! I guessed the D80 would be totally lost! I am not sure about the 18-200mm VR. It needs optical alignment for sure. Anyway, I need to bring them to Nikon and see if they can be recovered. They are now in Intensive Critical Unit, ICU! I told my student that this accident can be fixed by money. I will pay for my beloved camera and lens. But some accidents in physics lab would not be fixed by money, perhaps fatal or irreversible! One must be very careful in handling equipment. Anyway, this is not the end of the story. When we almost finished the hike, I wristed my two ankles 拗柴! 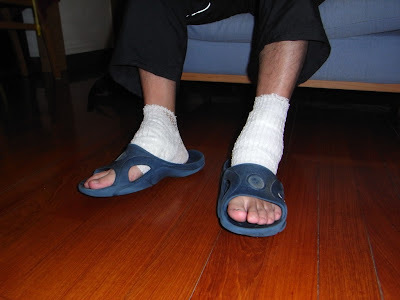 It was the first time I hurt both ankles simultaneously! In fact I haven’t seen any people hurt their two angles at the same time! Poor me! I wish I can recover quickly. Otherwise it will ruin my Christmas holiday completely! No stargazing!!! My two ankles were wristed! 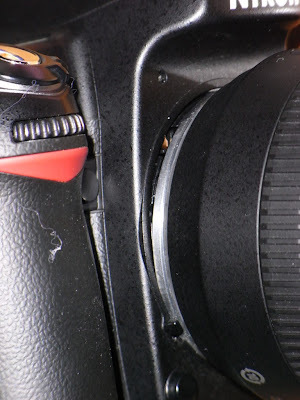 My D80 was seriously damaged! See the gap between the lens and the body. This part is supposed to be very tough! But cracked now!!! 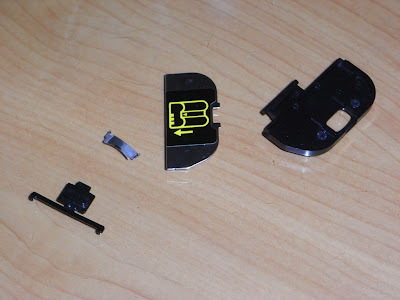 These are the bits and pieces from the inner part of D80 and battery compartment. In fact some parts are missing! Your Christmas holidays are just fine as I could see. About the camera, I think that's the reason why I never hand any of my equipments to any other person. I rather drot it myself. Well, there is a good reason for a new piece(s). Map and compass must come as handy as possible, big pockets helps. It was fate! I just asked hom to hold it & to do any operations. The camera just gone in 5 seconds. It's really a loss and I feel sorry too. But I think you are not going to but another camera of the same level. Upgrade, upgrade, upgrade......Yeah! That's money, money, money..... No!